Grab a kayak, inner tube or other floatation device and jump into Portland's Willamette River. Dametris Harrison floats alongside swimmers near Waterfront Park. Every summer since 2011, thousands of wet and wild revelers have formed a massive flotilla on the Willamette River next to downtown. Why? From Portland’s mayor to a bare-chested Batman, they do it because they can. Every July, The Big Float sets sail! A celebration of the river that runs through the city, this collection of inner tubes, floating loungers and inflatable toys makes a scene with a pre-float parade, but nothing beats the image of this motley crew enjoying the sun and splashing around at the height of Portland’s summer. The flotilla drifts downstream about half a mile before putting out at the Tom McCall bowl just south of the Hawthorne Bridge in downtown’s Waterfront Park. Floaters supply their own tubes and lifejackets, and the most outlandish watercraft and costumes earn awards. The Big Float usually begins with a morning beach clean-up, followed by a synchronized swim performance by the Rose City Raindrops. Two inner tube parades then take to the street to march toward their put in point at Poet’s Beach, while a floating barge with live music sets the mood throughout the day. The Big Float culminates in an after party at Tom McCall Bowl Beach where the most creative float and costume winners were crowned. More of a landlubber? You can watch from the Hawthorne Bridge or breeze into the beach party, where food carts and live music make a real splash. 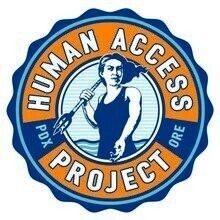 The Big Float is also the main annual fundraiser for the Human Access Project, a non-profit local organization that helps increase access to the Willamette River.